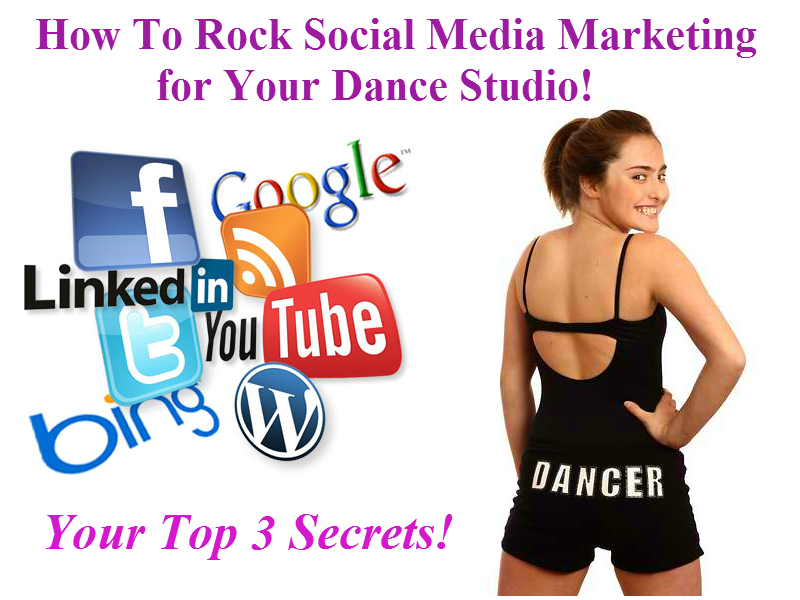 The Top 3 Secrets Every Dance Studio Owner Should Know About Social Media Marketing - The Let's Talk Dance Blog - Empowering Dancers To Create A Better Quality of Life! 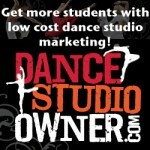 Yesterday I had the pleasure of being the guest speaker on a teleseminar for the members of Dance Studio Owner.com. I shared some valuable tips and strategies for how to grow your dance studio through social media marketing, and answered lots of great questions that every studio owner has about navigating social media marketing. We had an awesome time! 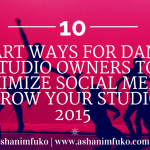 What is the true purpose and true value of social media marketing for your dance studio? Social media is not where you focus on selling or promoting. S – Show your customers that you care. H – Help to improve their lives & brighten their day. I – Inspire them to be the best that they can be (both parents and students). N – Notify your fans and followers about important information from your studio. E – Engage in social interaction and conversations that build trust. Social media is where you build trust and relationships with your current and potential customers. Think of it as a small town. How would you treat your neighbors, friends, students, fellow business owners, and customers that you interact with on a daily basis, if you lived in a small town? – You would be kind, welcoming and pleasant. You would say things like “Good Morning!”, “How are you today?”, “How are the kids?”, “Have a blessed day!” etc. – You would recommend things that you thought might be useful or helpful to them, like a new restaurant opening, a new service at your local retail store or bookstore, and local discounts or perks. You’d ask them if they were going to a local event, etc. – You would answer their questions, and ask them questions. Additionally, you’d make suggestions and give advice on how to help their child succeed in their dance classes, great healthy snacks for them to eat, stretches that they should do at home, inspiration, life advice, tips on how to deal with conflict, how to stay motivated, etc. THESE ARE THE TYPES OF THINGS YOU SHOULD BE SHARING ON SOCIAL MEDIA!! 1. Focus On Quality vs Quantity. a. Remember that the goal isn’t just high numbers on social media for show. The goal is to build a community of loyal people that know, like, trust, and refer you to their friends. That can only come through building relationships online. b. Facebook shows your page updates no love if your engagement is low. You could have 30,000 fans, but only 150 people are seeing your posts, because your engagement is so low. Organically, only 15-20% of your fans see your updates. Facebook set it up this way because they want you to pay for sponsored posts and ads, in order to reach your entire audience on a regular basis. But, there’s a way around this. The more your fans engage with you, like, share, & comment on your posts, the more those particular people (and their friends/family) will get to see your content. c. So don’t get stuck strictly on having big numbers. Focus on quality vs. quantity. Build a community online that engages with you and interacts with you, and that you can inspire to take action. a. What do you do? Everyone can see it ( and trust me, people are watching)! Face them head on, and turn the situation around. Most of the time, people just want to be heard. It’s a great opportunity to show how gracefully you can handle conflict, and turn it into a positive. b. Respond quickly, apologize for the inconvenience (just like you would in person), and offer a solution, or more than one solution. Let them know that you’ve heard their cry, and that you are working to resolve it. You’d be shocked at how many conflicts are resolved and turned around just by doing that! ALWAYS maintain a positive and empathetic attitude, and respond quickly with care, and with a solution. c. When in doubt, if you have a crazy person on your hands, DELETE THEIR COMMENT & BLOCK THEM!! 3. Who Should Post your Updates? Dance Studio Owner #1 – You are very knowledgeable about social media marketing and online branding, it’s something that you’re really passionate about, you read books and blogs on it every day. You may have even taken a social media marketing course or two. Plus, you like to be in total control of what’s being posted on your social media sites every day, so you’d like to manage it yourself. You’ve been doing it for a while and getting fantastic results, i.e. increasing numbers every day, lots of engagement, and lots of new students and opportunities as a result. My Recommendation: Go For It!! You obviously have the knowledge and the know-how to get it done, and have managed to carve out the appropriate amount of time to manage it successfully. Kudos to you! Dance Studio Owner #2 – You understand the importance of being active on social media, and that it’s necessary to have a clear strategy and to be consistent every day, in order to get results, but you simply don’t have the time. You have an admin employee or intern who is competent, and who you trust to maintain it every day, with a little training and direction from you. My Recommendation: Take some time to write out what your marketing and financial goals are for the year. Then based on that, write down your social media marketing strategy for the entire year, including what types of updates you plan to post (with specific examples), when they should be posted, where you will get the content to share on social media, how to respond to inquiries, comments, and questions on social media, plus any contests, sweepstakes, or giveaways you plan on doing throughout the year. Lastly, train 1 or 2 of your social media-competent and media-savvy staff members or interns to manage it for you every day. 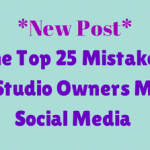 Dance Studio Owner #3 – You are someone who is aware of the importance and significance of social media marketing for any small business, and you get that you should be using it at as part of your studio’s marketing strategy but you either: a) don’t have the time to deal with it. b) don’t know enough about it to do it effectively for your studio. c) would rather outsource it, and not be bothered, because you have more important things to focus on. My Recommendation: Outsource it to a professional (not your niece, nephew, or cousin, unless they are a social media marketing professional, and that’s what they do for a living.) Hire a professional to come in, and create a social media marketing strategy for your studio, based on your marketing and financial goals, and let them manage and maintain it for you on a daily basis. Or, allow them to create a strategy for you, and give you all of the tools and resources necessary to manage it in-house, on a daily basis. Make sure you spend time with this person, and share with them your goals for the year, the culture of your dance studio, your studio’s mission and values, etc. in detail, so that they can come up with the best strategy for you. Then they can manage it for you each day, and still work closely with you to ensure that the messages, images, and content being shared on social media truly reflect your dance studio, and help you reach your marketing and financial goals. These are just a few tips to help you have more success, and get better results, with the social media marketing strategy for your dance studio. If you have more questions or comments, please feel free to share them below. Please share this post on Facebook, Twitter, Linkedin, and your favorite social media sites if you found it helpful.